Top Beijing foreigners’ favorite streets. Silk Street is not actually a street anymore. Several years ago, there were many vendors on both sides of the street. Now they have moved into a building. The name silk street doesn’t mean that you can only buy silk here. Actually, you may find all kinds of things here, clothes, handbags, souvenirs, shoes etc. Wangfujing is now home to around 280 famous brands of Beijing, such as Shengxifu hat store, Tongshenghe shoe shop, Wuyutai tea house. A photo studio which took formal photos of the first Chinese leadership, the New China Woman and Children Department Store helped established by Soong Ching-ling (Mme Sun Yat-sen) were also located on the street. Wangfujing has a selection of exotic food on the Snack Street as well as lots of mouth-watering common foods, such as Chuanr (meat kebabs, commonly made of lamb) and desserts like Tanghulu and candied fruits. There have been many time honored shops here, such as Ruifuxiang Silk Store, Zhangyiyuan Tea Shop, Shengxifu Hat Shop, Tongrentang Pharmacy,Neiliansheng Shoe Store and so on. The list above are all tranditional Chinese shops with hundreds of years’ history. 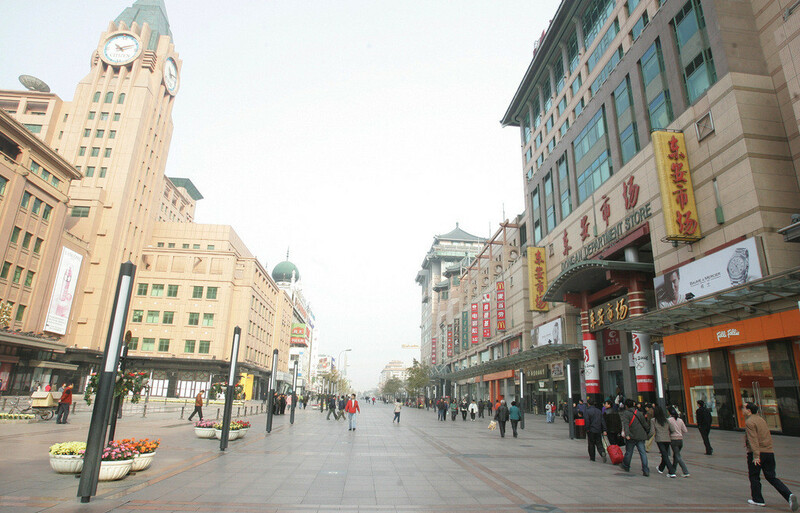 Sanlitun has been one of the most popular entertainment areas for foreigners in Beijing. In the daytime, this place is a stylish and modern shopping center.In the night, it turns to a stirring bar area. It is a good place for people to relax. If you like to hang out in the bars, you cannot miss this place. The Houhai Bar Street in the famous Shichahai area of Beijing is a place where traditional Chinese and western culture hits. When the first bar opened at a common Siheyuan (四合院, quadrangle courtyard) in the area in 2000, there were only approximately a dozen of bars in the Shichahai area. Three years later, a great cluster of new bars surged in the area within half a year and now over 120 ones welcome visitors from all corners of the world every evening. 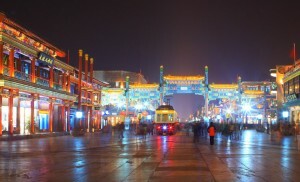 In recent years, the bar street in the Houhai area has been one of the most bustling places of Beijing in the evening. For people who visit Beijing and prefer killing time in a bar, Houhai is without any doubt an ideal choice. Chang’an Avenue was once said to be the widest and longest avenue in the world. 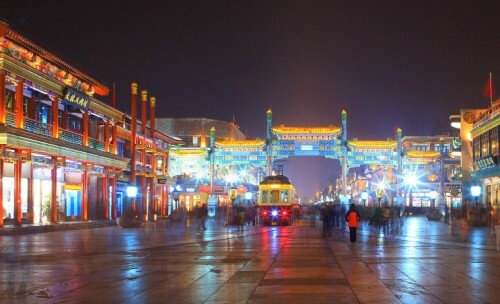 It is a landmark of Beijing in both ancient times and modern times. Demarcated by the Tiananmen Square, the eastern and western parts are named as East Changan Avenue and West Changan Avenue respectively. It is the east-west axis of the Beijing City, connected with a series of streets. 2-Day Tour: Forbidden City, Tian’anmen Square, Temple of Heaven, the Great Wall, Ming Tombs Hotel Package, from $238.